TORONTO -- Ontario's legislature plunged into chaos Wednesday as protesters and most of the Opposition were ejected for disrupting the government's efforts to revive a bill slashing Toronto's city council nearly in half just days after a judge found the legislation unconstitutional. Shouts erupted from the public gallery and some hecklers were led out in handcuffs as Premier Doug Ford argued he was protecting democracy by invoking a constitutional provision to override the court decision, which found his plan to cut council during an election campaign violated freedom of expression rights. "This is about preserving the will of the people, this is about preserving democracy," Ford said, citing his Progressive Conservatives' victory in the spring election. Asked whether he believed in the Charter of Rights and Freedoms, the premier said a democratically elected government should not be derailed by a "politically appointed" judge. Ford has maintained cutting Toronto city council to 25 seats from 47 is necessary to streamline decision-making and save taxpayer money. The New Democrats attempted to drown out the reading of the bill by banging on their desks, prompting the Speaker to kick most of their ranks, including Leader Andrea Horwath, out of the house. Horwath said her party members had launched their protest to show they wouldn't accept Ford's "heavy-handed" decision lightly. Earlier in the day, members of the public in the legislature voiced their own discontent by coughing in unison to drown out the premier when he tried to speak. That disruption quickly turned into a series of shouts and heckles. "Shame on you, this is not democracy," one man shouted at the premier. "We are the people." The commotion drew repeated reprimands from the Speaker, who briefly recessed the house. The public gallery was cleared of all spectators and at least two protesters were handcuffed and taken away by security officers. Laura Barrett, a Toronto supply teacher who lined up to watch the debate but couldn't make it inside before the gallery was shut down, said she wanted to show her disapproval at what she called a "constitutional tragedy." "It's totally antithetical to the idea of democracy and it's a real mess," she said, calling it absurd to reduce democracy to voting every four years. "That's the whole point of the charter, it outlives and outlasts any one political movement or party...it goes to our fundamental rights as people. So don't trample on those, but especially not for this, this is the pettiest thing." 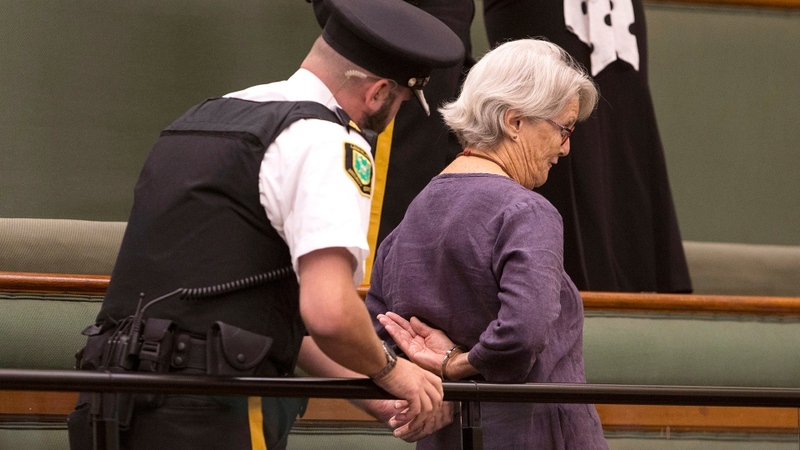 The action at the legislature took place during an emergency session called by Ford -- his second since taking office in June -- after the court decision that went against his government earlier this week. The province's use of the notwithstanding clause -- a provision being invoked for the first time in Ontario -- has drawn condemnation from critics, who've said it was not designed to deal with this kind of issue. Toronto Mayor John Tory has said invoking the notwithstanding clause is a "gross overreach" of the province's powers, adding city staff will advise councillors at a special meeting on Thursday how the municipality can proceed with the upcoming Oct. 22 election. Horwath accused the premier of trampling people's rights to pursue a personal vendetta against Toronto, where Ford served one term as a city councillor and unsuccessfully ran for mayor. "It's a black eye for our province," she said. "It's a shame that our premier is such a petty, vindictive human being whose focus is on himself and his own quest to show those folks in Toronto that he's the boss of them." Interim Liberal Leader John Fraser said his party would introduce an amendment to the bill that could delay its passage after it is reintroduced. "There was chaos inside here today," he said. "The premier has made a decision that has created instability and uncertainty and divided people." "It is wrong for the premier to attack our fundamental charter rights for political gain," he said. "He is bringing a dangerous view of democracy to Queen's Park, predicated on his belief that he can rule by decree." Ford does, however, have his supporters, some of whom have voiced their approval of the premier's moves. "Your voters are 100 per cent with you Premier Ford," one person tweeted in response to a message from Ford about the reintroduction of the bill. "We elected you to save the taxpayers money and to fix the huge mess the Liberals left the province in. And that is just what you are doing." Political analysts said it's difficult to gauge just how the move is playing out among residents in the absence of public opinion polls on the issue, but predicted it would have a polarizing effect. Jonathan Rose, an associate professor of political science at Queen's University, said the decision may appeal to some of Ford's base because it targets "many people's favourite whipping-boy," the City of Toronto. But he said Canadians consistently rank the charter as one their most prized institutions and some may conclude the premier is against it. "I think more reasoned, moderate conservatives might wonder why the premier is using such a powerful instrument on an issue that's ... not important in the minds of voters," he said. 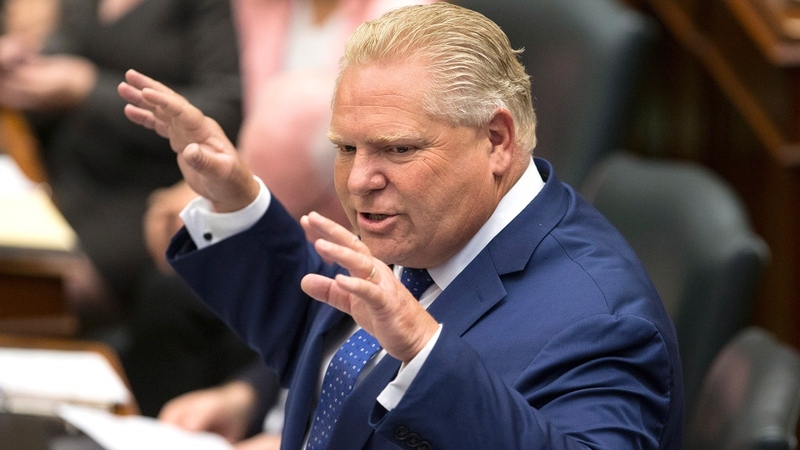 Ford has said Tory legislators will be free to vote as they wish on the council-cutting bill and a major public service union urged them to break from party lines and oppose it. But it's unlikely any will break ranks on this issue, said Genevieve Tellier, a political science professor at the University of Ottawa. The government is still new and legislators won't want to jeopardize their futures by publicly opposing their leader so early on, she said. She said Ford's assertion that the courts are interfering with a democratically elected government goes too far, since democracy depends on the checks and balances provided by an independent judiciary. "An elected official doesn't have full power to do whatever he wants, she wants -- there are some rules to follow, those of the constitution," she said. "The judge reminded him about that."